Hearing that Denison's 32.59m megayacht Caribbean Sparkle has been sold, I call Lon McCloskey at The Marine Group and he confirms that the deal closed last Friday with no other brokerage house involved. Delivered in 1991, she was last refitted in 2005 and Lon says that she's been a tad neglected over the past 18 months and is ready for another refit. 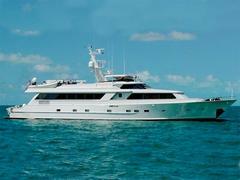 Caribbean Sparkle sleeps up to eight guests in a master, VIP and two twins and was asking $1.495 million.